It must come to the West, right? Monster Hunter 4 is certainly on some wishlists among the Nintendo Life staff, and we're sure the same applies for a number of 3DS gamers. It arrives in Japan on 14th September, so envious glances are becoming increasingly frequent as we wait for news of potential localisations to North America and PAL regions. Capcom has been dialing up the hype in recent weeks and months, of course, with various trailers and updates revealing new details. When it comes to trailers, however, we suspect the most recent is the best and more exciting to date; it shows three-minutes of battles, weapons, armour sets and the various characters and locations that'll be central to the story. The goal of adverts like this is to make us want games more than we did before. In this case, we think this one may succeed — check it out and let us know what you think of it. This must come to the west. I LOVE the new bug like monsters!! Amazing. Looks like they're adding a bevy of new mechanics while keeping what we all love about the franchise intact. Consider me thoroughly hyped! Why is this a 3DS exclusive again? Release the damn game on Wii U as well!!! I would love to have a home console version of this. +500 hrs right now in MH3U 3DS so I can wait for this to come! Seeing how incredible this looks just makes me want it on Wii U even more. Eagerly awaiting news of a localization! Now if you'll excuse me, I need to pick my jaw up off of the floor. @Ecto-1 Monster Hunter 4 is on the 3DS. if there truly is a god, we will see a release of this in the west. Nintendo and Capcom, PLEASE make it happen, I love MH 3 Ultimate and can't wait for more! To be honest, MH3U is my first Monster Hunter experience. And for the first couple of weeks, I was hooked and couldn't put it down. I made it only to the *** (3 star) missions and couldn't get passed one monster! Grrr! I tried, and tried, and just could not beat him! I finally moved on to other games since then but regret thst I have not played it in months! But last week, I finally got my first Spotpasses (2 in a row believe it or not) for this game and my curiosity for this game started up again. Like I said before, this is my first Monster Hunter experience so I don't know what I'm doing wrong here . I only use shield and armor for every mission since I like that set up. I don't know if that's the reason I can't get pass my current mission. Should I change to other weapon types? Anyhow, this trailer is super sweet but I can wait a while for this one since I know I've only scratched the surface on MH3U. I'm sure we'll get this like how we got 3G (even if I started to give up hope on it towards the end until Reggie threw Ultimate in our faces, lol), its going to be a while sure, but it'll come. Anyways we need more monster like the beetle and scorpion...things...whatever they're called. Monsters that fight together, hoping that they'll revamp Rathian and Rathalos because currently they act like they're the only monster there when they're both in the area, lol. Is it just me or is the 3DS the best thing ever? @rmeyer Why would you rename a series that has existed since 2004? Renaming it wont change anything except confuse the fans. If it was the second in the series and the first didn't sell, renaming could work, but MH3U sold really well on 3DS and Wii U. Eagerly awaiting Capcom's "You must beg some more first" message. Nintendo really need this on Wii U as well, I like the 3DS/Wii U save share idea, they should do it with more games. Everytime I see a new trailer for MH4 I get so pumped! I wish next month was also the launch of the game here in the states. I really really really hope this game comes West. MH4 for the 3DS and Monster Hunter Frontiers for WiiU- both with epic custom system bundles! OT: I NEED THIS IN MY COLLECTION RIGHT NOW! This game looks amazing! I need this! I need this NOW! Capcom seems to be satisfied with the sales of Monster Hunter 3 Ultimate in the West, so I don't see why it shouldn't make it here, at least by 2014. The name isn't the problem. 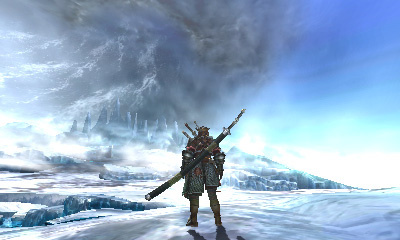 Monster Hunter is a really love or hate kind of game, either it clicks or it doesn't. Its not an easy series to get into. Besides, those "insecure teens" you speak of aren't actually the majority of consumers and chances are they aren't apart of the target audience either. The series is about as different from most main-stream games as you can get, its much closer to Dark Souls or Persona, especially outside of Japan. IDK why you call the EUR versions of 3DS pal still, maybe because of the past? Make HD version for Wii U and localize it , i will throw money at this thing! You HEAR ME CAPCOM! i will preorder this second! My guess is though we will get monster hunter 4(insert something extra) version which will be made like 3 Ultimate with both systems. From looking at the video i do like the addition of the insect monsters and it seems the game is slightly faster paced then previous versions especially with the on the wall scene and the lots of jumping. Also no UNDERWATER fights! I am so happy to see them gone. I am however suprised at the lack of showing the two new weapons but thats all well and good. Somebody make a petition in miiverse! This game must come to the west on the Wii U! My computer wont let me watch it. WHYYYYYYYYYYYYYYY? 3DS is on its way to become one of the greatest consoles of all time. I agree with others that say this game should be brought to the west as a Wii U HD version. I'm interested in playing this game at home but not so much on a handheld. That Rathian Charge Axe. MUST. HAVE. I know, I was just saying that I hope they also release it on Wii U, like they did MH3U. Want this now !!! come to europe in septemer ! Would love to see it be released on Wii U also ! Whats with all these epic trailers!! Please bring this to North America Capcom!!!!!!!!!!!! @rmeyer I guess Medal of Duty: Monster Massacre will sell better to our "insecure teens". Eh? Eh? Game of the Forever, right there. I want that limited edition 3DS XL over here as well. As if the 3DS wasn't selling good enough as is, this game will permanently cement the 3DS as the dominant force in the market. Monster Hunter 3 ports are one thing, but a brand new numbered entry in the series... it's over with. I love mh3u. I really want 4 though. Playing with my friends is the best part of the experience for me and when this comes out i can actually play online with them because they all have both versions of the game and i only have the 3ds version. WIIU please. I can't view it either. Its the most anticipated trailer to see this year for me at the moment. LOL for reals. @JaxonH The main problem with the Vita is Sony's indifference to the platform. It's almost like they don't care, and it's costing them. What happened to all the major titles that the PSP got? Even if Monster Hunter was lost, that is one series. Yes it's popular in Japan, but it's not like Monster Hunter does COD numbers in the rest of the world. Why is the Vita not getting anything? Surely a company like Sony can toss some money around and get some key exclusives. We are talking about a handheld with PS3 level power. Where is the support? Sony needs to get alot more aggressive with the Vita. Get the killer games like God of War on the system, cut down the number of PS3 ports, and get Square Enix to do a Final Fantasy VI remake on the system. I love the PSP(along with my DS) and it's sad to see where the Vita is. Sony got killer games on the PSP. Two God of War Games, Gran Trusimo, tons of JRPGS, Metal Gear Solid: Peace Walker, the games were on the PSP and the made it a great platform. Now, they have basically handed the market to Nintendo. It's one thing for Nintendo to win the market through hard work and having the more popular system. But to offer barely anything and hope your shiny tech and cross play will sell your system is stupid. The handheld market is big enough for two very successful systems. The DS and PSP proved that last gen. Now, it's just Nintendo and a company who barely cares about their handheld. JUMPING ON TOP OF A MONSTER AND RIDING IT LIKE A RAGING BULL!!!! I loved MH3U, and now I'm going to love MH4. I'll hold out for a Wii U version...but only for a little bit. First things first...give me news on localizing the 3DS version! This definitely is the best trailer yet, can't wait for the announcement of Monster Hunter 4 for other regions. I hope this comes to Wii U but if not I will definitely get it on 3DS. It looks awesome alright! Wow wow wow!!!! Now, to wait another year (hopefully) for USA to get it.... lol That looked intense and amazing! If the wii u version looks like the cutscenes in this clip, THEN I'll be impressed. Agree with everyone who says we need a WiiU version! Or I need a 3DS either need this game NOE pay attention. That was an interesting video though I wish they showed more of the monster resurrection mechanic for the new dark monster. @idork99 I'm going to guess that you're having trouble with an underwater monster (probably Ludroth or Gobul) especially if you're using a lance. If the problem is Ludroth you can always wait for him to go back on land since he does that frequently. Gobul you can try fishing out using frogs (or wait for him to come out of the water). However, the problem could be that you aren't grinding enough to upgrade your armour or weapons (which is a possibility since this is your first Monster Hunter game). Another possibility is that the weapon you've chosen doesn't mesh well with your own play style (block vs dodge). Last bit of advice don't try to tank attacks, usually the damage you take won't be worth it. Actually, there could be another aspect. You might be playing on Tanzia Port (Solo). Those missions are tougher than the village quests. If that's the case, I'd recommend doing the village quests first to build up your arsenal. This game is better on a big screen, 3ds is just to small for this. I'm just getting into G rank in ultimate, so I can wait. Holy crap this looks awesome. I imagine that Capcom are pushing the 3DS hardware like never before. @DESS-M-8 - There is no Wii U version. Id love for this to grace our shores,but what I would really love is if we get a monster hunter 4 ultimate for wiiu and 3ds package like we did with 3. I dont normally buy 2 versions of the same game but I did for 3 ultimate and would for 4 ultimate if they make one! Either way though just release it in the west please capcom! I'd love for this to come to Wii U. I think I might be the only person that is going to miss underwater fights though. Please tell me hunting horn returns! I think this would be great if it came to Wii U. Could really boost sales. One thing special about Monster Hunter to me is that, although I've never played anything outside of a demo, I get chills every time I see a trailer for a game in the series. @rmeyer Before Christmas?! Lol, I hope you mean Christmas 2014 because there is no way they'll be releasing MH4 in the west this year! Do you have any idea how long it takes to translate every single piece of text from Japanese to English? We had to wait a year and a half for MH3U to be released. I will learn Japanese for this game just to play if we do not get a localization. "It must come to the West, right?" With Iwata personally making sure that some top tier titles come to the US, it'd be completely foolish for him to ignore this.